DeMarcus Lawrence a.k.a. “Tank” was born in Aiken, South Carolina on April 28, 1992. Lawrence is a defensive end in the NFL for the Dallas Cowboys, who drafted him in the second round of the 2014 NFL Draft. He played college football at Butler Community College before transferring to Boise State. 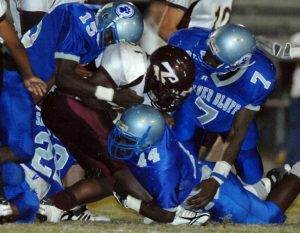 DeMarcus Lawrence attended Silver Bluff High School in South Carolina, a perennial small school powerhouse. Under head coach Al Lown, the Silver Bluff Bulldogs have won more than 200 games and five state titles. Coach Lown played the relatively small DeMarcus Lawrence at tight end his first few seasons in high school. Thanks to a growth spurt in 10th grade, the 6’2” 210 pound Lawrence finally found his calling on the defensive side of the ball at defensive end and defensive tackle. Lawrence recorded 97 tackles and three sacks as a defensive tackle his senior year. Lawrence wasn’t considered a top level recruit during his time at Silver Bluff. He did however help lead his team to a 9-3 record his senior season and was the Class AA All-Region choice. Unfortunately, he didn’t receive a whole lot of interest from major colleges and it wasn’t just because of his size either. 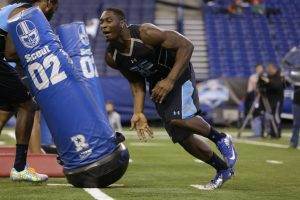 DeMarcus Lawrence struggled in the classroom because he didn’t take his schooling seriously. It ended up affecting the interest he received from collegiate programs. DeMarcus Lawrence also excelled in baseball and basketball. During his final campaign of his high school career he helped to lead the Bulldogs basketball team to a 17-5 record. DeMarcus Lawrence didn’t receive any scholarship offers to play football collegiately, but he continued his gridiron career at Butler Community College in Kansas. DeMarcus Lawrence started off his collegiate career at Butler Community College in El Dorado, Kansas. Lawrence played two years at Butler before ultimately deciding to transfer to Boise State. In 2010, he enjoyed a red-shirt season. The following season in 2011, he earned the first team J.C. Gridwire and second-team NJCAA All-American honors. The team won the Jayhawk Conference and Region IV Championships, finishing the year ranked second in the national poll. DeMarcus Lawrence was also named to the first-team All-Jayhawk Conference with 72 tackles (50 solos), the second most on the team. He also registered 12 sacks and recovered four fumbles, one of which he returned for a touchdown. Lawrence was ranked 38th on the Rivals.com JUCO Top 50 list and after his 2011 season, he signed with Boise State in December. 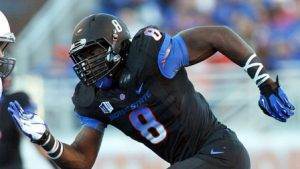 Lawrence started 11 games at weak-side defensive end during his first year at Boise State in 2012. He recorded 48 tackles (24 solos), led the team and league with 9 ½ quarterback sacks, forced four fumbles that tied for eighth nationally, recovered two fumbles, and had one interception. DeMarcus Lawrence also recorded the only blocked kick for Boise State. His first year performance for the Broncos earned him All-Mountain West Conference first-team honors. DeMarcus Lawrence started 12 games at weak-side defensive end in 2013 and finished third on the team with 72 tackles (39 solos). Lawrence ranked 10th in the nation with 10 ½ quarterback sacks and ranked third in the nation with 20 ½ stops or losses, leading the MWC. After blocking one kick the previous season in 2012, Lawrence followed that up with two blocked field goals in one game against Southern Mississippi. Based on his 2013 performance, he earned All-American second-team honors from Walter Camp and for the second consecutive season, he garnered the All-Mountain West Conference first-team accolades. For his entire collegiate career, DeMarcus Lawrence started all 34 games he appeared in, recorded 192 tackles (113 solos), 32 quarterback sacks, 53 stops for losses, six fumble recoveries, eight forced fumbles, four pass deflections, and one interception. Lawrence decided to skip his final year of eligibility and entered the 2014 NFL Draft, and was selected by the Dallas Cowboys in the second round. 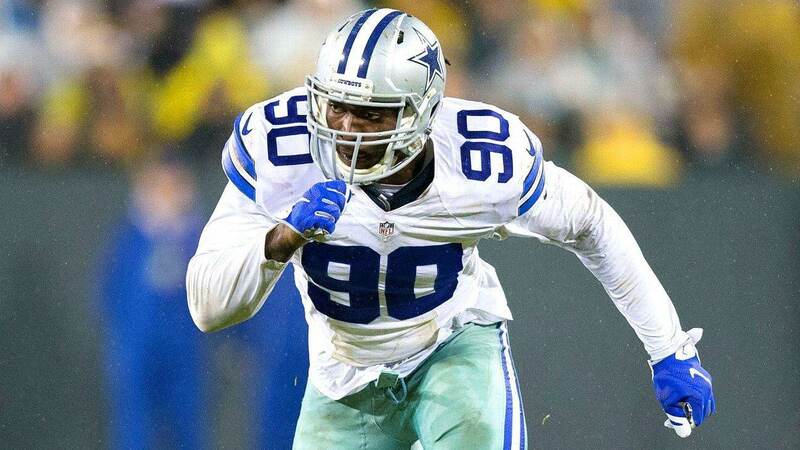 The Dallas Cowboys absolutely had to address the defensive line in the 2014 NFL Draft after waving franchise sack leader, DeMarcus Ware, and losing starters Jay Ratliff and Jason Hatcher to free agency. The Cowboys decided to address the defensive line in the second round when they made a trade with division rival Washington for their 34th draft pick. 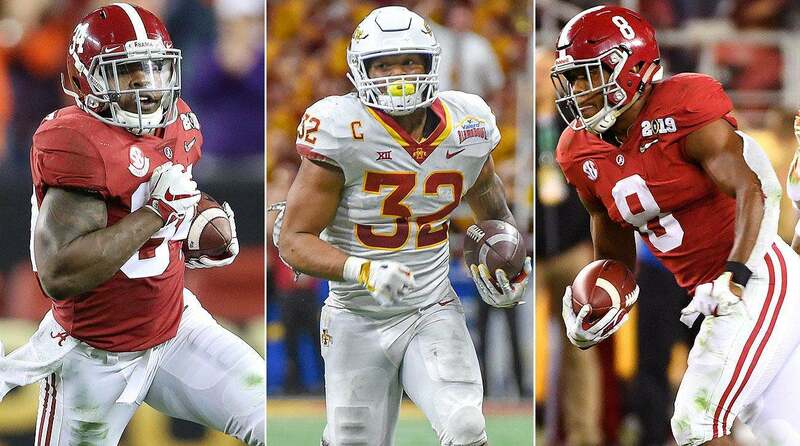 For the 34th pick, the Washington Redskins received the Cowboys 47th overall pick in the second round (Trent Murphy) and the 78th pick in the third round (Spencer Long). With the completion of the trade, the Dallas Cowboys decided to draft the Boise State Broncos defensive end, DeMarcus Lawrence. The Cowboys viewed Lawrence as the best remaining defensive end in the 2014 NFL Draft and a player that could play as the LEO (left end) or the right defensive end in the Cowboys’ 4-3 scheme. DeMarcus Lawrence’s professional career didn’t get off to a very good start in 2014. The rookie defensive end fractured his right foot in training camp and had to start the year on injured reserve. Lawrence’s first appearance on the field as the right defensive end for the Dallas Cowboys was in week 9 against the Arizona Cardinals. Unfortunately, the lost time affected his performance on the field and he finished the regular season with just 11 tackles and zero sacks. Lawrence did play a significant role in the wild-card playoff game against the Detroit Lions on January 4, 2015. DeMarcus Lawrence nearly made the play that would have ended the game with the Cowboys leading 24-20, with just about two minutes remaining in the game. Matthew Stafford fumbled deep in Detroit’s territory, but instead of just falling on the ball, DeMarcus Lawrence decided to scoop the ball up and try to score. Unfortunately, Lawrence fumbled and Detroit recovered the ball. Lawrence would however redeem himself on the ensuing drive. Detroit was facing a 4th and 3, with a minute left in the game. The Lions were nearly in field-goal range, but DeMarcus sacked quarterback Matthew Stafford causing a fumble. Lawrence wisely fell on the football this time and didn’t try to advance it, thus sealing the game for the Dallas Cowboys. In preparation for the 2015 season, DeMarcus Lawrence transformed his body with the help of the Cowboys’ strength and conditioning program, in hopes of being better prepared for the season. With the addition of Greg Hardy, DeMarcus Lawrence was moved to left defensive end and would end up having a bigger impact than he did as a rookie. His improved physical presence and pass rushing skills continued to develop on a weekly basis. He had a streak of at least one sack in each of the last seven games, and finished the season with a total of eight. He also finished second on the team with 31 quarterback pressures and 56 tackles. In January 2016, DeMarcus Lawrence had back surgery that ended up being more serious than expected. DeMarcus Lawrence was penalized the first four games of 2016 due to violating the league’s substance abuse policies. The total value of DeMarcus Lawrence’s rookie contract is $5,506,648 and is fully guaranteed to make $3,895,138 of that. DeMarcus Lawrence will make an average of $1,376,662 per season over the entirety of his four-year rookie contract. He is entering the third year of this contract and will make $920,604 and have a cap number of $1,501,813 in 2016. In 2017, Lawrence will make $1,170,906 and will have a cap number of $1,752,115. He hasn’t really done much to warrant a second contract from the Dallas Cowboys, but if he can keep his nose clean and continue to progress, he could become a fixture on defense for years to come.